Sandcastles Unit 407 - Luxury DIRECT BEACHFRONT condo with tropical beach decor. "Why spend your hard earned money staying in a side 'ocean-view' condo with a peek of the ocean when you can stay in our DIRECT BEACHFRONT condo with an awesome oceanfront view?" Our luxury beach front condo has exquisite tropical and beach decor. It has 2 bedrooms (king size bed in master suite, two beds full & twin in the 2nd bedroom, condo sleeps 5 max.) and 2 bathrooms, ceramic tile throughout, beautiful fully equipped kitchen, full size washer and dryer, living room, dining area, bar/counter. Our condo has been recently updated with beautiful new 6-panel doors, new trim-work new vanities with granite counter-tops in each bathroom, and many other updates throughout. Enjoy spectacular beachfront sunrises from our 4th floor balcony/patio. View cruise ships and rocket launches. Closest beach to Disney World. Minutes from Port Canaveral cruise terminals and Kennedy Space Center. Less than an hour from Orlando International Airport and Disney World. Just steps from the beach, swimming pool, hot tub or tennis court. Minutes to restaurants, shopping and entertainment. Our goal is to provide the best direct beachfront condo in the Sandcastles complex for a reasonable price with all the amenities you'll need for a memorable relaxing stay at the beach. You'll only need to pack your clothes, we provide the rest. Feel free to contact us today to reserve the relaxing vacation you deserve. Welcome from Tim and Sandy Randolph. We live in the Columbus, Ohio area. We traveled to Sandcastles for a vacation in 1999 and was very impressed with the well-maintained condo complex and the beautiful wide soft-sand beach. We immediately decided we wanted to own a condo in the Sandcastles complex and purchased Unit 407. Our condo has an amazing direct beachfront view. You can sit on the 4th floor balcony patio and watch the most amazing beachfront sunrises over the ocean. We're positive you will enjoy our Unit 407 as much as our family does. Sandcastles is a very well maintained and managed condominium complex located directly on the Atlantic Ocean, with a heated pool, hot-tub and tennis court. Unit 407 is a DIRECT BEACHFRONT unit with an amazing oceanfront view. You can stay at Sandcastles and enjoy beachfront accommodations at a location less than 45 minutes from the Orlando International Airport, less than an hour from Disney, and, less than 10 minutes from the Port Canaveral Cruise Port and many fine restaurants. You won't be disappointed with Sandcastles and our very well maintained and beautiful condo. Bathrooms recently updated with new vanities, granite counter-tops, faucets & other beautiful décor. Direct ocean with awesome beachfront view from the 4th floor balcony & master bedroom. Fully equipped with all appliances, pots and pans, dishes and utensils. Large dining table with 4 chairs and a bar with 3 bar stools. 42' Flat Screen TV. Wall-mounted Flat Screen TV's in each bedroom. Beautiful direct oceanfront view. Seating for four(4) and bistro table on balcony. 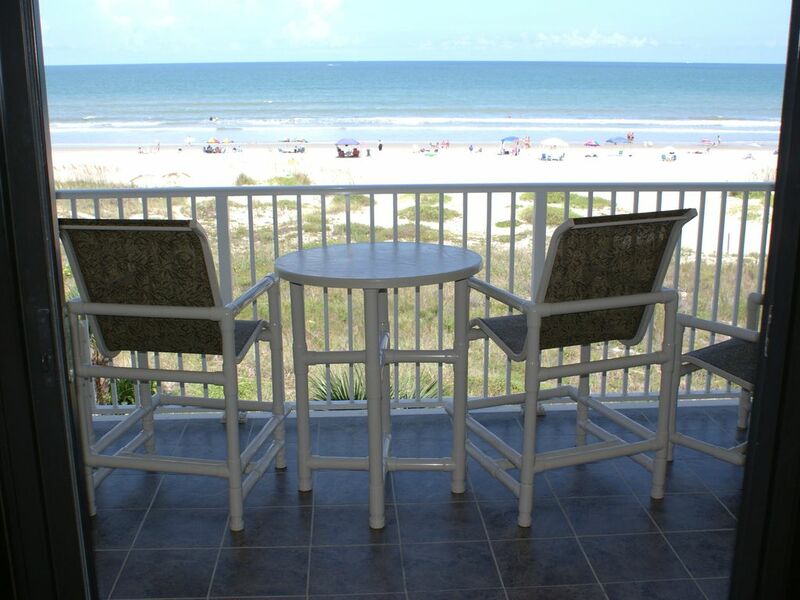 Beachfront balcony patio with awesome direct beachfront view of the ocean & soft sand beach. Large heated pool for Sandcastles guests. Beach umbrella, boogie boards, beach chairs, sand toys, small cooler provided. This place has everything you could need for a great vacation. All the amenities, fantastic location and friendly people throughout. Highly recommend this condo...it is awesome. The property was beautifully decorated and clean. We enjoyed sitting on the awesome balcony as much as on the beach. It felt homey, which I like even when on vacation! Great place for a great location! My best endorsement is to stay there again. I will be booking it if it’s available! My husband and I absolutely loved our stay here in Cocoa Beach! Tim and Sandy are wonderful hosts- very quick to respond to any question we had! The condo has an amazing ocean view, we loved sitting out on the balcony. We also loved being steps away from the beach! The location is great, quiet and relaxing, a short walk to a couple restaurants that we loved. The condo itself is very nice and spacious. Clean as well! Fully stocked kitchen was great when we wanted to make our own meals. Overall, we can’t say enough good about this condo and Tim and Sandy as hosts. We will be back! A beautiful, well-maintained condo with a fantastic view of the beach/ocean. Nice heated pool for those warm afternoons, and great location for restaurants and walks on the beach. Will definitely consider another visit. Updated, clean and very comfortable. Great location to local restaurants and amenities. Definitely our #1 consideration for the future. Close to Port Canaveral cruise facilities & restaurants, Kennedy Space Center, Disney World, Patrick Air Force Base. Closest beach to Orlando. Less than 45 minutes from Orlando International Airport. A refundable security/damage deposit is required for first time guests. NO PETS. NO SMOKING. No Cleaning Fee for Weekly & Monthly Rentals Must be 25 years of age to rent condo. Condo has sleeping accommodations for a maximum of 5 occupants.